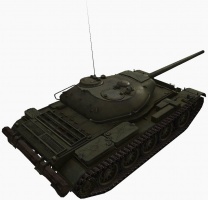 The T-54 is a Soviet tier 9 medium tank. The first prototype was constructed at the end of 1944. 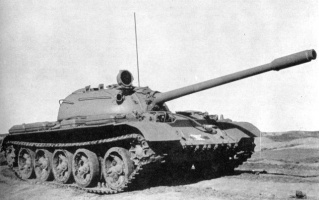 After successful trials in 1945–1947 the T-54 mod. 1947 was adopted for service. 713 vehicles were constructed before production was phased out. In 1949 production of a new variant was launched. 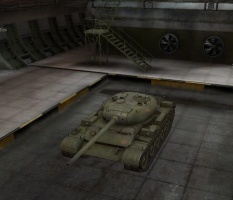 The T-54 leads to the T-62A, and the Object 140. 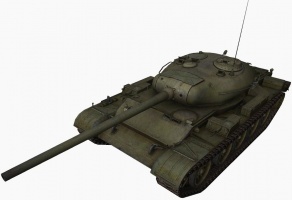 The T-54 is the ultimate main battle tank. It features a great combination of speed, armor, and firepower when fully upgraded. Its well sloped 120mm front can be quite bouncy against lower tiers. The turret is also very well armored, and can reliably bounce shots, with the only weakspots on it being the two small cupolas which can be rather difficult to hit. 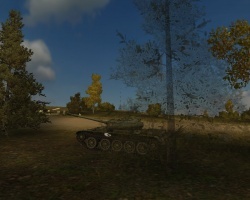 There are two viable gun options on the T-54. One is the D-54(leading to the T62A). The D-54, when compared to 105mm L7A1 armed NATO counterparts, is lacking in standard round penetration and alpha, but make up for this with its good handling and shorter reload, making a decent sniping gun. 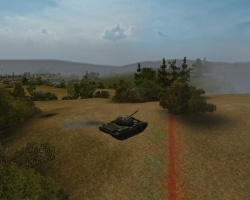 The D-10T2S, in comparison, is a rather unique weapon for its tier: it shares some similarities with the M46 Patton's 105mm T5 gun, having lowish accuracy and even worse standard penetration for generous DPM; however the gun depression and handling are less than satisfying, relegating it to brawling/flanking duties. To compensate for these obvious shortcomings, both guns feature the same excellent 330mm pen HEAT round which is more than enough to deal with even the most heavily armored targets. 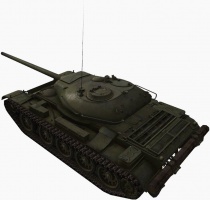 The T-54 also has a great specific power of 19.74 HP/T, and in conjunction with a traverse speed of 48 deg/s, fantastic terrain resistance, and a top speed of 56km/h make the T-54 extremely mobile, second only to the barely armored Leo PTA or the AMX 30 when compared to other tier IX medium tanks, except autoloaders. Keeping all this in mind, in battle the T-54 plays as the ultimate medium tank. It's low profile can allow it to sidehug tall papertank heavies such as the E-75, Mauschen or Type 4 Heavy, it's mobility lets it perform flanking maneuvers with ease, and when the fight gets tough, the tough frontal armor and excellent gun will help it survive. The only limitation to this tank is the poor gun depression, which somewhat limits it's ability to abuse terrain, but asking for more would just be greedy. The LB-1 carries over from the T-44. Research the LB-1 gun if you have not already. Then pick whatever gun you want (with either of the top guns, you will earn the XP needed for the engine and suspension much faster than with the LB-1), both have the same research cost. 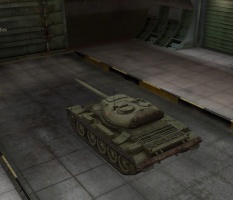 Research whichever tank you want, be it the T-62a, or Obj 140. 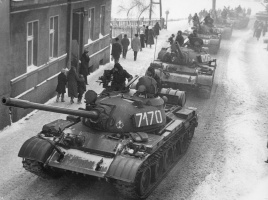 The T-54 and T-55 tanks were a series of main battle tanks designed in the Soviet Union. 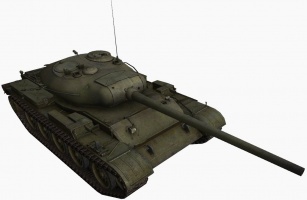 The first T-54 prototype appeared in March 1945, just before the end of the Second World War. 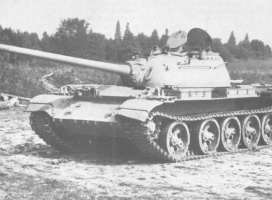 The T-54 entered full production in 1947 and became the main tank for armored units of the Soviet Army, armies of the Warsaw Pact countries, and others. 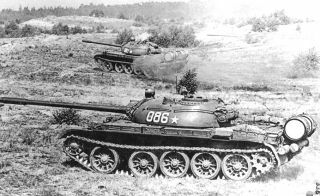 T-54s and T-55s were involved in many of the world's armed conflicts during the late 20th century. It is the most produced tank in human history. Development of the first T-54 prototype started in October 1944 at the OKB-520 design bureau, at the Stalin Ural Tank Factory No. 183 (Uralvagonzavod), in Nizhny Tagil. The initial design was completed in December, with a prototype completed in February 1945. 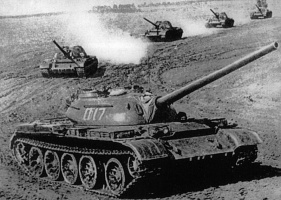 Trials conducted between March and April 1945 resulted in the new tank being commissioned for service with the Red Army as the T-54. 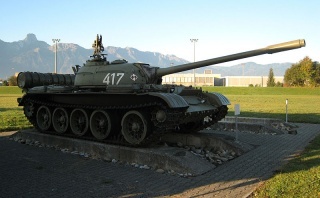 The tank had virtually the same hull and drive train as the T-44. Major differences included thicker front armour (120 mm on the upper section and 90 mm on the lower section) and a newly designed driver's hatch and vision slot. The turret ring increased in diameter to 1800 mm and had thicker armour (180 mm on the front, between 90 mm and 150 mm on the sides and 30 mm on the roof). The main armament was the 100 mm D-10TK cannon, with two 7.62 mm GWT machine guns. The tank was powered by a new V-54 12-cylinder 38.88 litre water-cooled diesel engine developing 520 hp (388 kW) at 2,000 rpm with a two-stage reduction gearbox. Fuel capacity was increased to 530 litres in the internal fuel tank and 165 litres in the external fuel tank. 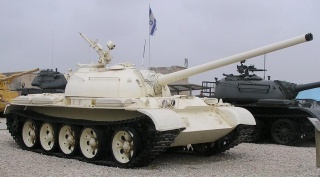 Unlike the T-34, the external fuel tanks were connected to the fuel system. The rubber rollers on the road wheels were widened. 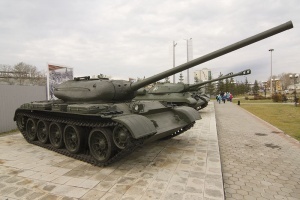 The T-54 weighed 35.5 tonnes, making it slightly slower than the T-44 at 43.5 km/h. The road range increased to 360 km. 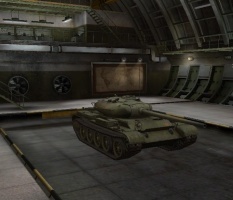 It was decided to modernize the tank before production started. 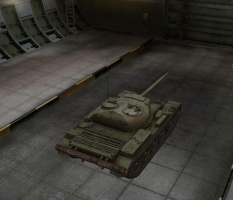 The new tank's turret was tried on two modified T-44 tanks. 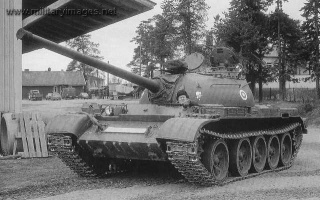 Another T-54 prototype was built in July 1945 which received the alternative designation Ob'yekt 137. The tank was equipped with a new turret armed with 100 mm LB-1 tank gun and 7.62 mm SG medium coaxial machine gun. The turret armour was thickened (200 mm on the front, between 125 mm and 160 mm on the sides). The tank was armed with two 7.62 mm SG-43 medium machine guns mounted inside fixed boxes on the fenders, each with 500 rounds of ammunition and operated by the driver. The turret was fitted with a 12.7 mm DShK anti-aircraft heavy machine gun. The fuel capacity was increased to 545 litres in internal fuel tanks and 180 litres in external fuel tanks. Because of this, the road range remained 360 km despite the increased weight of 39.15 tonnes. This prototype went through trials between July and November 1945. Although there were numerous drawbacks which required correction and many alterations which had to be made to the vehicle's design, it was decided to begin serial production of the new vehicle and the vehicle officially entered service on 29 April 1946. It would go into production in Nizhni Tagil and Kharkiv in 1947. * The 100 mm D-54 has substantially lower penetration than the U-8TS used by the Tier 10 Soviet medium tanks; they are historically the same gun with different stabilization systems. This page was last modified on 6 October 2018, at 08:22. This page has been accessed 757,567 times.